It's difficult to imagine how an ancient city developed into a modern metropolis especially when archaeological records are confounded by settlements spanning many cultures over more than 4000 years. However, Jerusalem has an almost perfect record, the origin of which remained untouched and was only recently discovered. From the site of its origin, the city obtained its holy reputation on the mountain known as Mount Moriah, but one major event in the life of King David left its mark on our modern retrospective. I watched a video on the Hamas strategy to attack Israel using tunnels built and destroyed during Operation Protective Edge in Gaza. It was not the preemptive intelligence of the Israeli Army or the conviction of politicians that exposed the high-level threat, it was the seemingly unrelated brutal murder of three young Israeli Yeshiva students that instantly unified the nation and transferred their nationwide sentiment to an authority to act. Their defense force ultimately finished the job. A similar transference of authority was granted to King David at a crucial moment in Jewish history. The City of David, the original Ancient City of Jerusalem exists outside of the walls people know as the Old City of Jerusalem. The walls of this higher elevation Old City, built ~500 years ago, during the Ottoman period purposely cut off the Ancient City, disposing it, relegating its lower elevation, to the garbage dump that The City of David became. In the following image, the Old City walls enclose today’s Temple Mount, Jewish, Armenian, Christian and Muslim quarters isolating the City of David (South). Discovering traces of the first people that lived in the area required a combination of archaeological science, anthropology, cultural narratives and tradition. Each piece had to objectively fit in order that a theory spanning close to 5000 years of occupation could prevail. Remarkably the intact archaeology and narrative of Biblical forefathers seemed to weave into the perfect tale. Its a story of sporadic dwelling, holy attraction, ancestral honor punctuated by invasion, reclamation, growth, unrest, conquest, defeat, occupation, exile and return. However, without understanding transference of the nationally inspired authority to act, we can’t contextualize the archaeological "bread crumbs". This historical rewrite dates Jerusalem’s origin to the Early Bronze Age cave discovered behind the bedrock, entered through the cliff face of the Upper (High) Ridge, above the Upper Gihon Pool and Spring. The cave dwelling contains 3-4, hollowed stone places to sleep and internal family seating around a fire pit. 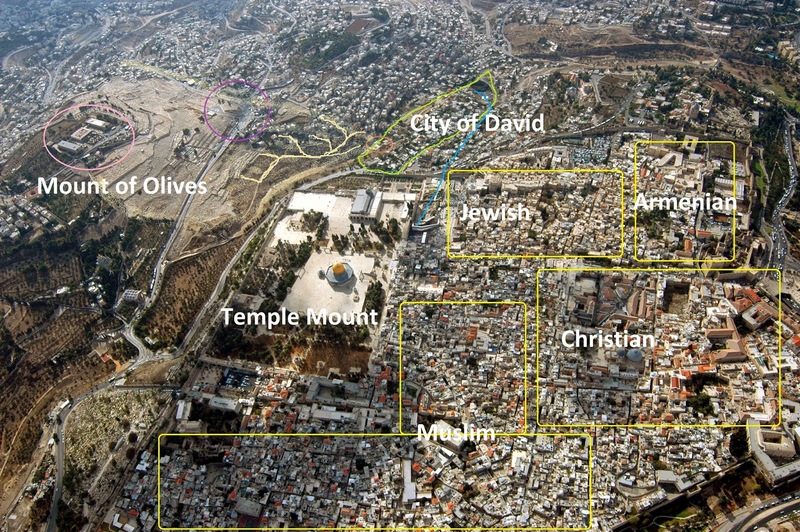 The approximate location can be seen (above) in the brown circle on the green boundary around the City of David. Simple dwellings, natural pools and worship on the upper ridge (facing East) preceded the later development of the more structured constructions represented in the image below. The preceding archaeology supports the Biblical narrative of Melchizedek, the Righteous King, High Priest of Salem, said to be Noah’s son Shem. Toward the end of his life he was visited by younger relative Abram, whom he blessed. Then, in the immediate years after Abraham bound and offered his son Issac as a sacrifice to God at Mount Moriah it became Isaac's home. Remarkably, there exists a most intriguing artifact located on the perfectly preserved Upper Ridge. The monument or matzevah on the bedrock of one of four chambers, I argue was erected by Isaac's son Jacob when he accepted his new name Israel and began developing Beit El (House of God) to fulfill his covenant made at that spot. According to many well known Jewish sources this matzevah was erected on Mount Moriah by Jacob and marks the place of the famous Jacob’s ladder dream. The same sources suggest it was located adjacent to the altar on which his father Isaac was offered. According to Jewish Law the altar on which Isaac was bound is the exclusive site of Israel’s Temple altar. After Jacob left Mount Moriah, him and his descendant nation Israel were exiled to Egypt, Jacob never returned. Some 200 years later, his descendant Joshua returned to find the Gihon Spring, Upper Ridge, Pool and new city occupied and protected by buildings, a fortress and high walls. Jewish sources tell of the pact Abraham and Isaac entered with the Father or Nation King (Avimelech) not to dispel his peacekeeping descendants from Abraham's ancestral land. Despite attempts by Joshua and the tribes of Israel, until the time of King David some 400 year later, Israel was unable to conquer the city from the Jebusite/Emorite descendants of Melchizedek's brother Ham, progenitor of Avimelech. Archaeological remnants of the walls of the Jebusite City demonstrate they were later reinforced, at the time of King David after he and his men penetrated the underwater channel of the Gihon Spring, entered the city, occupied it and lived together with Avimelechs’ remaining peacekeeping relatives including their Jebusite King. From this city, Jerusalem his ancestral inheritance King David progressively obtained control, extending the city and building his palace as a symbol of his nations center, but national authority was not easily forthcoming. After an extramarital affair with BatSheva, toward the end of King David's life a nationwide pandemonium inspired the essential, momentary transfer of authority. In the time between disaster and resolution, the King identified the holy temple site, built an altar at the top of Mount Moriah and designated it the location of the nations future Temple, which his son Solomon would build. 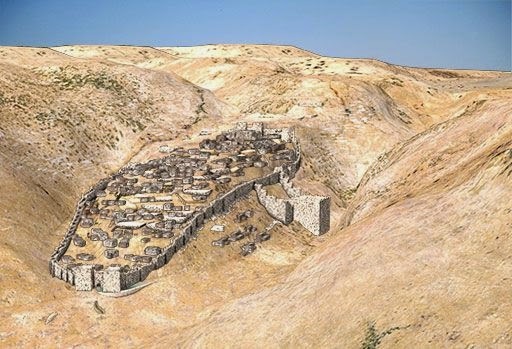 King Solomon followed his father’s extensive plan, extending the city walls north to the top of Mount Moriah where the First Temple was constructed and where the second Temple ultimately followed. The national unity engineered by King David did not last long, immediately following the reign of Solomon, his son Rehoboam was denounced by challenger Jeroboam and the nation, once again divided. In part Jeroboam founded his national support in pluralistic idolatry. Since then, some 2900 years ago, despite many royal attempts the tribes of Israel have never been reunited. Jacob left this site of his ancestors for Egypt and never returned. Joshua was unable to conquer it, King David declared the pact of his ancestors void, invaded and recovered Jerusalem city from occupiers. 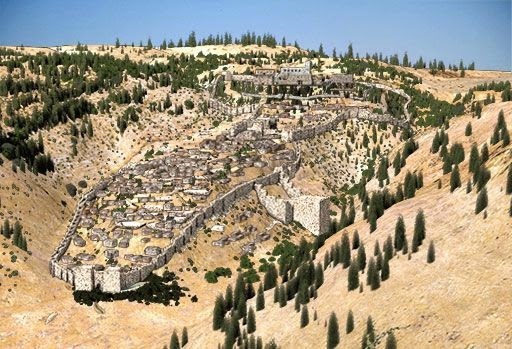 It's entirely possible they may have already buried the high ridge of the Gihon during the construction of their walls and certainly their citadel cut it off. Eli Shukron the lead archaeologist on the Gihon dig revealed that all four chambers of the Upper Ridge including the matzevah had been preserved in softly packed loose earth between two walls. The dirt contained small artifacts dated back to King Hezekiah. 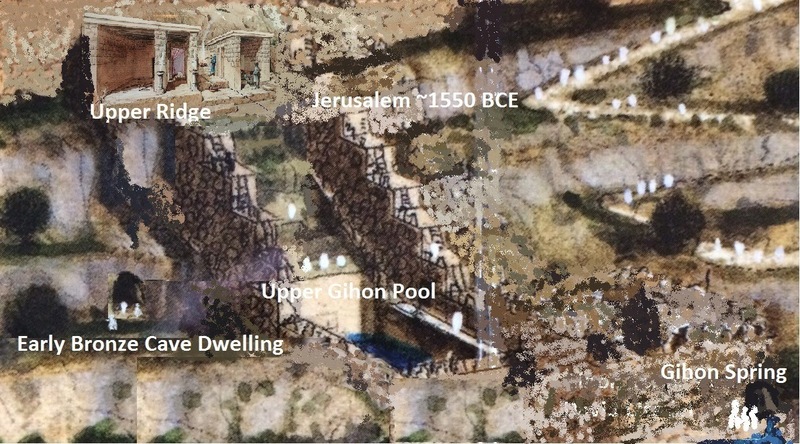 Perhaps Hezekiah had revealed it during his major excavation of the tunnel system that carried water from the Gihon Spring into the city's Shiloah Pool at the base of the Kidron Valley. Inevitably we must answer the question of the Upper Ridge. Whether King David knew of its existence and purposely obfuscated it, declaring the site on the top of the mountain the altar of the temple is irrelevant. If Jewish law prescribes the site of Isaac’s offering the only place for the Temple’s altar then we must ask - is the Upper Ridge at the Gihon that place and will we finally return to the forgotten cornerstone of our Jewish ancestral heritage?